On Friday November 20th.2009 Bob the Railway Dog arrived in Peterborough. From his prime position in front of the Tourist carriage he will continue to engage with his public as he did all those years ago when he rode the rails through this town. As well as Bob’s memorial, Peterborough now owns a superb piece of bronze sculpture by the South Australian artist Silvio Apponyi. He has captured the essence of Bob - free spirit but a friend to all, dignified with a touch of larrikin. In creating our Bob, Silvio has used an image from an original photo, one of a handful still in existence, taken by George Hiscock in Terowie in 1892. The engine drivers companion and every traveller’s friend. Where did Bob the Railway Dog come from? The story of Bob, railway mascot, really begins at Terowie in the mid north of South Australia as was reported in the Advertiser’s 1936 article titled “Owned Bob the Railway Dog – an interview with William Seth Ferry”. 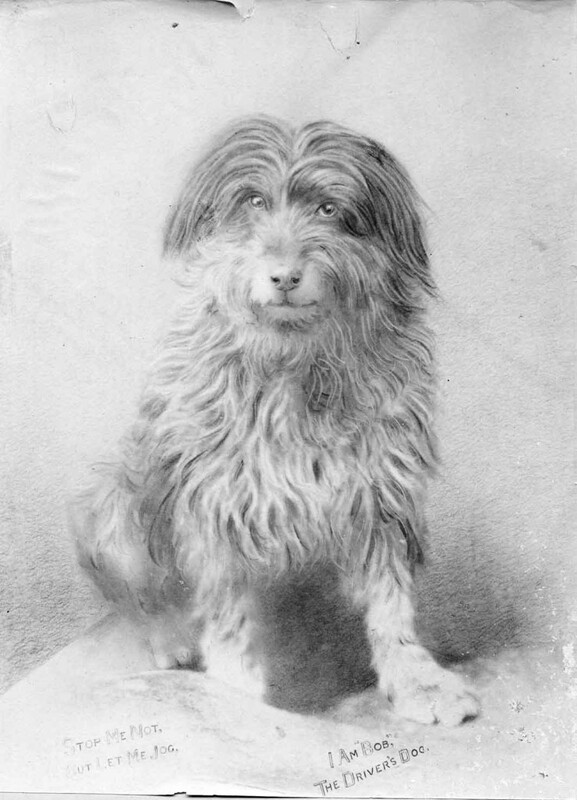 According to William Ferry he first saw Bob in a cattle truck at Terowie (where he was a special guard) with about 50 other stray dogs from Adelaide who were consigned to a rabbiter at Carrieton. He took a fancy to him and when they got to Carrieton offered to buy him. The rabbiter refused. He would however do a swap – one dog being as good as another! Willam went on to Pt. Augusta, found a stray dog at the Police Station, returned and made the swap.............and the rest is history. What was it that made him so special? He was a great charmer as this excerpt from the memoirs of Stephen William Quintrell shows - “So Bob continued on his merry way and travelled widely to Melbourne, Sydney and Brisbane. At the completion of every trip he always followed the engineman home and was an important visitor. When back in Adelaide he always went for a feed at the Eagle Hotel and the girls always gave him the best. Every traveller knew Bob and the children adored him. I have had him follow me home from Kingston. He was a most deserving dog. Some peevish drivers would put him off, and he knew them and never got on their engine”. Bob’ fame spread to overseas as these letters to the English Newspaper “The Spectator” show. “I often see interesting letters to the Spectator about dogs, and I thought perhaps your readers might like to hear about the best known dog in Australia. His name is Railway Bob and he passes his whole existence on the train, - his favourite seat being on top of the coal box. In this way he has travelled many thousands of miles, going all over the lines in South Australia. He is well known in Victoria, frequently seen in Sydney and has been up as far as Brisbane! The most curious part of his conduct is that he has no master, but every engine driver is his friend. At night he follows home his engine man of the day never leaving him or letting him out of his sight until they are back on the Railway Station in the morning, when he starts off on another of his ceaseless journeys. I have not seen him on our line for some time, but noticed with regret last time he was in the station he was showing signs of age, and limping as he walked. E Cresswall. Adelaide, August 24th. 1895. What we do know is that he loved travelling on trains. And he loved the men that worked on them. When he heard the whistle of a train he was off! After this incident one of his friends, a commercial traveller, had a special collar made with the legendary inscription on it of “stop me not but let me jog for I am Bob the Drivers’ dog. This information has been kindly granted reproduction on Bob the Railway Dog Website from Heather Parker, Peterborough History Group SA. Inc.